Pete Brown Junior Tennis Program (PBJTP), a National Junior Tennis and Learning (NJTL) chapter, was founded in 2009 and, since then, has been dedicated to training diverse youth through developing physical fitness, sportsmanship, team work and education both on the tennis court and in the classroom. Based out of the public courts at Harvard Tennis Park in Los Angeles, the PBJTP was started in honor of the late Pete Brown, a local tennis coach who taught tennis and spread his love for the game in the South Central community for over 40 years. The PBJTP has served the Los Angeles community for almost 10 years, providing a safe and positive place for young people who have the desire to learn and excel at tennis. The PBJTP offers a variety of programs for children, which include free weekly supervised on-court tennis coaching and training for kids aged five to 18, tournament training, player support, as well as a mentoring program, with all tennis coaches serving as mentors and role models to emphasize the importance of hard work, determination and perseverance. Besides the on-court instruction, the NJTL focuses on children's academic development through their Academic Creative Engagement program, also known as "ACE." ACE was designed to encourage academic achievement, health and wellness and social emotional skills to help guide children in their daily lives. On May 19, the PBJTP will be given the gift of art from the USTA in conjunction with Chase, when four of their public courts will be transformed into a one-of-a-kind piece by local artist Charlie Edmiston. 2017 US Open women's semifinalist Coco Vandeweghe will take part in the celebration and will join Edmiston for the live painting session that day at Harvard Park. "This is exciting for the children," said PBJTP board member Marty Woods. "This is something different. There's a lot of energy at the park, so this will capture it." Pete Brown Junior Tennis Program – Live! 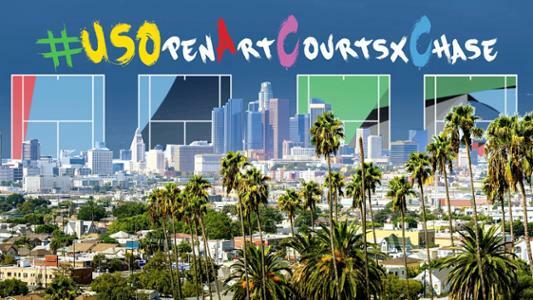 Join the 50th anniversary Art Courts celebration in Los Angeles, and tune in to US Open Facebook Live, Periscope and YouTube at 12 p.m. PT (3 p.m. ET) for the live painting show, hosted by Vandeweghe.